Balance the federal budget in 3 days? These guys did it! Put two high-level Republicans, two high-level Democrats and a politically savvy moderator around a table for three days, and what do you get? Heated, ideological arguments that lead nowhere, right? Well, not exactly, as the editors of Esquire were surprised to learn last year. 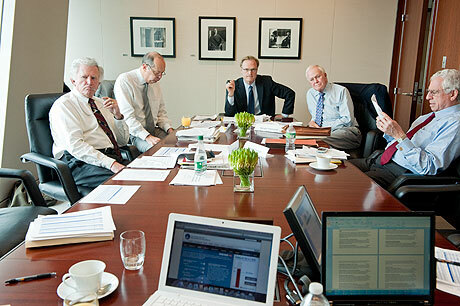 In August 2010, Esquire invited former US Senators Gary Hart [D-CO], Bill Bradley [D-NJ], Bob Packwood [R-OR], John Danforth [R-MO] and MSNBC’s Lawrence O’Donnell to sit down together in New York City for three days. In a fly-on-the-wall background story, Esquire describes the deliberations in blow-by-blow detail. Except that no punches were thrown. Instead, the atmosphere around the table was collegial, respectful, serious-minded and solution-oriented. Participants applied their collective experience and expertise to the tough financial issues that, in today’s Washington pressure cooker, seem impossible to resolve. According to Esquire, the assembled brain trust touched all of the financial and social hot buttons, but managed to keep their cool and stay above the fray. Trying to balance the budget meant discussing Social Security, Medicare, military spending, taxes, health care, energy policy, farm subsidies, earmarks and other subjects that have become radioactive in Washington. They would argue, mostly, but also agree and reminisce and speak in Senate shorthand, and unlike the conduct that has come to define our poisonous contemporary political moment, each side would not ascribe the absolute worst motives to the other in order to make its points. No one would be accused of being out to destroy the Constitution. No outlandish conspiracy theories would govern the judgment of the participants. No one’s values would be held as suspect. No one’s very legitimacy would be in question. Rather, these senators were the very picture of spirited and rigorously informed good government. Reading Esquire’s account of the experiment, one cannot help but feel that America’s deficit problem is eminently solvable—if only we could take politics [meaning self-interest, influence from lobbies, the lust for power and sheer meanness] out of the equation. I know: fat chance. But I once heard a corporate board chairman say that most managers intuitively know exactly what needs to be done to solve a particular problem, but that they lack the will to make it happen. Judging from the conclusions drawn by the Esquire Commission to Balance the Federal Budget—a group of smart, former elected officials who Gary Hart described as “beyond ambition”—the answers are not that hard to figure out. And what surprised everyone was that when the agreed-upon ideas got a thorough, financial reality check, they not only balanced the budget, they created a $12 billion surplus. And that’s just the tip of the iceberg. There are 17 more proposals where those came from, and—spoiler alert—the commission not only managed to balance the budget in 2020—they achieved a $12 billion surplus. They not only reformed Social Security—they guaranteed its long-term solvency. And they not only proposed to keep tax rates low—they found a way to keep them at or near their current levels for the next decade. And they did it all in three days.